JIO Telecom Network , the most rapidly grown telecom network . Jio is the first Indian telecom network which has grown so fast and compeleted the target of million users in few month . Due to excitng and attracting offer launched by jio it attracted more users toward itself . 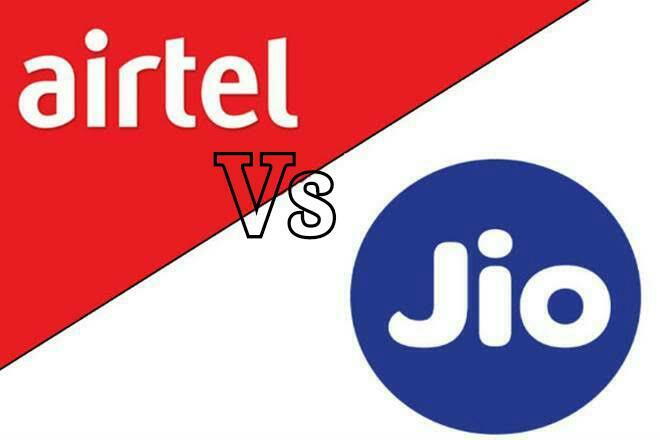 And after the launch surrounding of competition has setup between telecom network companies .Each telecom network are trying to compete with the offers launched by jio .So every telecom network companies are launching their own offers similarly to jio offers and trying to beat jio offers . Now to compete with jio Airtel, India’s biggest telecom operator, has launched new plans in the market to take on newcomer Reliance Jio’s prepaid offers. The move is believed to counter the intensifying bitter pricing war ongoing in the Indian telecom sector. Airtel has launched prepaid plans of Rs. 399 , Rs 349 , Rs 309 to counter Reliance Jio’s prepaid offers. To compete with jio Airtel launched Rs. 149 plans similar to jio 149 Rs plan .On compariing both plans Airtel offers unlimited Airtel to Airtel calls to the consumer. This pack also offers 2GB data at 4G speed with a validity of 28 days. On the other hand newcomer Reliance Jio’s Rs. 149 plan offers unlimited local and STD calls to any mobile and even landline across India. This pack also comes loaded with 2 GB data for 28 days. Well, here Jio consumers surely get more benefits. Both Bharti Airtel and Reliance Jio offer Rs 349 plan. This recharge pack is limited to the prepaid users only. Taking a detailed look at both the offerings, Airtel is offering unlimited local and STD calls to its users in this plan. Along with the free voice calls, it is also offering 28GB of 4G data for 28 days. There's a daily FUP limit of 1GB for this Airtel plan. Also Read :- To Compete With Jio 4G Phone Airtel Is Planning To Launch Their 4G Phone At Price Of 2500 Rs . Coming to Jio, it also offers a Rs 349 plan. Again, this plan is also limited to the prepaid users only. Under the Rs 349 plan, Jio is offering unlimited voice calling (Local and STD) to its customers like Airtel. Jio is also offering 20 GB of 4G data for 56 days. This plan doesn't come with any FUP limit. As a one time offer, both the companies – Airtel as well as Jio are offering the Rs 399 plan for its consumers. While Airtel’s Rs 399 plan offers unlimited local and STD calls and 1 GB data per day for 84 days at 4G speed the competitor Jio’s 399 plan also offers the same plan. The only feature that gives Jio consumers a reason to smile is that Jio’s Rs. 399 plan is open for all whereas Airtel’s Rs. 399 recharge plan is offered to select customers only.